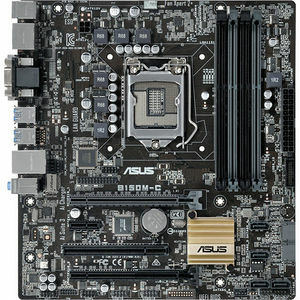 The Intel® B150 Express is a single-chipset design that supports 6th-generation Intel LGA1151 Core™ i7 / Core i5 / Core i3 / Pentium® / Celeron® processors. It provides improved performance by utilizing serial point-to-point links, allowing increased bandwidth and stability. It natively supports up to six USB 3.0 ports, six SATA 6Gbit/s ports, and PCIe 3.0 lane speed support for faster data retrieval. Intel® B150 Express chipset also supports iGPU functionality, so you'll enjoy the very latest Intel integrated graphics performance. Intel® SBA (Small Business Advantage) is a combination of hardware and software that provides unique security and productivity capabilities designed for small businesses. Intel® SBA requires MEI drivers (AMT host software kit) be installed.